The word cob, used to describe a type of horse, is more commonly used in the U.K. than North America. Nevertheless, you may run into cob sized tack, or hear someone describe a horse as 'cobby', or a cob. A cob is a sturdily built horse, about 15 hands high, with a steady temperament. They look like a large pony but are over the pony height. A cob is a type of horse rather than a specific breed. Cobs are equally at home under saddle or in harness and are often all-purpose horses, both when horses were needed for transport and now when an owner wishes to have both a sturdy riding and driving horse. Besides their relatively large bones, solid joints, sturdy build and almost pony-like appearance. they may give the impression of being built like a square or being a bit short legged. Cobs have a docile temperament. They often have copious manes and tails and leg feathering, similar to the Clydesdale or Shire horse. There is no real size specification for cobs, but generally, they are of riding horse height, under 16 hands. Their necks are heavy and give the impression of being arched, and their heads may be common, and sometimes even roman nosed. They come in every color and with every sort of marking and coat pattern. Cobs gaits should be comfortable, and their way of going strong and steady. Cobs are not a specific breed of horse, rather they are a type of horse. Because of their substantial build, they can carry large adults easily, but not be very tall to get on and ride, like a draft horse. This doesn’t mean that draft horses can’t be cob types. 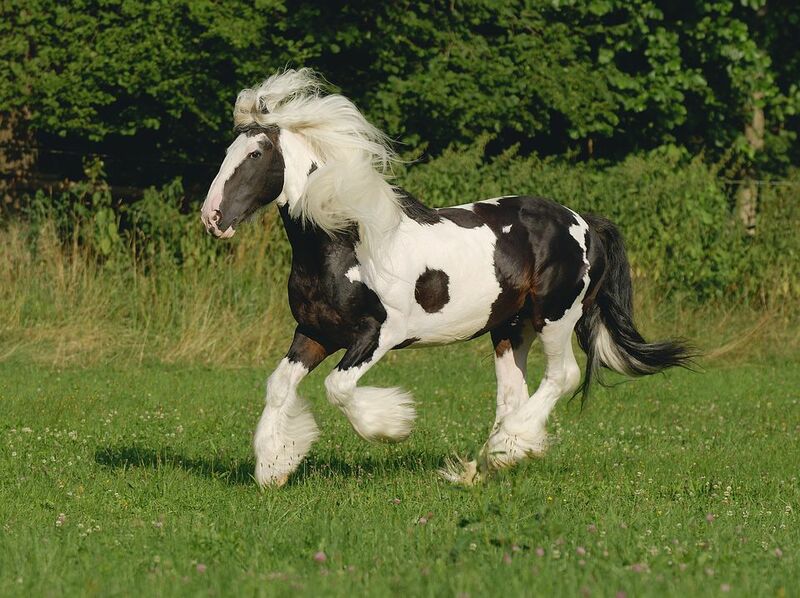 The Gypsy Vanner, Norman, or French Cob and the similar Breton Horse, also from France, are draft breeds of the cob type. But the most well-known cob type riding horse is the Section D Welsh Cob. In fact, some Arabians, American Quarter Horses, and other sturdy light horse breeds may be cob types. Many draft crosses are cob type horses, especially if they are under 16 hh. There is also a breed called the Norman Cob, which originated in the Normandy region of France. Cobs are used as pleasure riding horses, in the sport of field hunting and in harness. When shown, they often have their mane hogged or roached. This practice harks back to the time when it was more practical to keep the mane out of the way of reins and harness than fussing over braiding it. Leg feathering may be clipped. In the U.K. cobs are shown in classes according to size and strict dress codes are required of the riders. Horses are shown on the flat and over jumps. In North America, Gypsy Vanners and Welsh Cobs are shown but are left with natural manes and leg feathering. When you are shopping for tack, especially halters and bridles, you may notice some are marked cob sized. Tack marked cob intended for horses smaller than a large horse, but larger than a pony. If you have a Morgan, Appaloosa, Quarter Horse, Arabian, or other smaller more compact riding horse breed, cob size might be the right size to buy. How Safe Is It to Feed Horses Watermelon?